It is always fun to make crochet flowers and crochet roses are the best flowers of all. Who doesn't feel special receiving a rose, whether it's a red rose for love or another color for friendship, joy, and celebration? These ten crochet roses patterns include patterns for appliqués that can be used for bunting, jewelry and gift tags as well as rose patterns for clothing, accessories and home decor. Celebrate someone special with a crochet rose today - especially if that someone special is yourself! 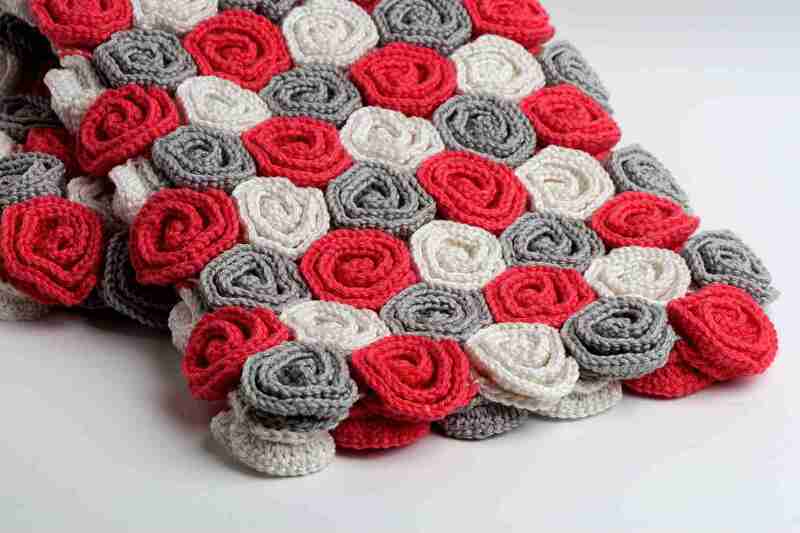 This is the Rose Field Baby Blanket crochet pattern sold by Tanya Sh on Ravelry. This would make an amazing gift for anyone or a terrific addition to your own blanket collection. This is the kind of handmade gift that really tells the recipient how much you care about him or her; it is the kind of love they can wrap themselves up in whenever they are feeling the chill of loneliness. Alla Koval Designs offers this adorable crochet roses brooch pattern free on her blog My Little City Girl. It can be pinned to other crochet items, like hats and shawls, or used as is. Make it in several colors as shown in the design or make all of the roses red for a more classic piece of jewelry. This crochet pattern inevitably makes me think of The Yellow Rose of Texas Song. It's a free crochet pattern from KatiCrafts that is worked in a long spiral row and then stitched together to create the three-dimensional shape of the flower. There are many different ways to crochet roses and this shows you one of the more unique options that is surprisingly easy to do. This beautiful crochet pattern for fashion roses is available only as a pattern diagram or symbol chart. If you know how to read one, you can make this lovely design. It was included in Top Inspired's roundup of ten free crochet flower patterns. This one can be used as a doily or table decoration or framed as wall art. It could also form the center of a larger lacy piece. Tamara of Moogly created this free crochet pattern for small rosettes and leaves. You can use it to make small bouquets for decoration, including wedding decor, or to add a floral touch to baby projects. This is one of those patterns that puts a nice spin on a classic design to give us something a little bit new. This terrific crochet doily pattern was originally published in Woman's Day Magazine in the 1980s. It is still a cute crochet pattern for use in contemporary homes and can be found free online from LaceCrochet on Flickr. The best part about this one is that the roses protrude with a bit of 3d appeal while the heart doily itself lies flat. It is a great conversation piece. Make it all in one color as shown or make the roses stand out even more from the background by changing colors. Mama in a Stitch created the free crochet pattern for the roses that are used on this purse. Then she created the tutorial for the purse, too. This is a lovely way to take crochet flowers on the go! This free crochet pattern by Cre8tion Crochet combines two of the best symbols of love: hearts and roses. This one is perfect for Valentine's Day but can make a great accessory all year round. Make one and attach it to a crochet cloche hat for a romantic outfit on date night. Make several and string them together as bunting for a party. This free crochet cardigan pattern by Gea Crea shows you how to make floral granny squares with roses at the center of them. This is a great design that can be used to make scarves, blankets and other items. In this case, you also get instructions to make the cardigan, with the rose squares at the bottom and terrific striping detail on top.